The Blue Ridge Parkway is a famous scenic roadway that runs for 469 miles from Cherokee, NC to the Shenandoah National Park in Virginia. The Parkway is known for it’s gorgeous high elevation scenic views and recreational activites. The Blue Ridge Parkway has been the single most visited place in the National Park System for almost every year since 1946. Blue Ridge Parkway in the fall – See our Fall Foliage Guide. Construction of The Blue Ridge Parkway, then known as the Appalachian Scenic Highway, started in 1935 at Cumberland Knob in North Carolina. The final stretch completed around Grandfather Mountain and Linville Viaduct was completed in 1987, 52 years later. 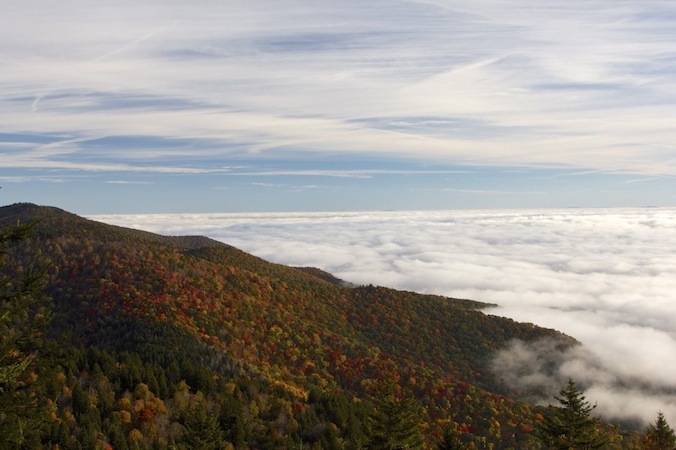 The highest point on the Parkway is south of Waynesville, NC near Mount Pisgah at 6053 feet above sea level, and offers a more than 180 degree scenic view that is literally breathtaking in clear conditions. The Parkway is an engineering marvel. While traveling on the parkway, you will cross numerous bridges, travel through short and long tunnels, cross over beautiful mountain streams, and see breath taking scenery and waterfalls from frequent overlooks. The Parkway is also full of wildlife, and you can often see bear, deer, coyotes, and bobcats. The Parkway is officially open year round, but many areas are closed during the winter due to ice and snow and the resulting hazardous conditions. One of the most popular and busy seasons for the Blue Ridge Parkway is during the fall when people from all over the world travel the parkway to see the fall foliage. Take your time and don’t hurry. The Parkway speed limit in most areas is 45 MPH with some sections 35 MPH and even 25 MPH in tight turns. Don’t speed! Many people are there to enjoy the views and will suddenly pull off or be driving very slow. If you speed, you could easily run into them or some of the wildlife around the Parkway. Take your time, go slow, and enjoy the views and journey. If you’re in a hurry, take one of the other major highways instead. We often get tailgated by drivers in sports cars thinking The Parkway is a test driving track. Don’t be that guy or gal. Fog and Rain – While traveling the parkway, you will often experience very thick fog and often rain. Be extra careful in these conditions. Turn on your headlights or even your flashers and slow down. We ‘ve often been in conditions where you couldn’t see more than 20-30 feet in front of your car! Fill’er Up! Make sure you have plenty of gas before you get on the Parkway. There are areas where there are no gas stations for more than 50 miles. You do not want to run out of gas, especially in some of the more remote locations. Bring lots of clothing. Due to the often significant elevation changes, weather on the Parkway can vary greatly by location and time of day. It can also be sunny and warm one minute, then a few minutes later, cold and windy. We suggest layering if you plan to be outside at all, and this includes even getting out at overlooks which can often be cool and windy. Pulling Over – Pulling over along The Parkway is permitted unless signs say otherwise. Some of the best and most unique views are available at locations other than the popular overlooks. Just make sure you pull completely off the parkway and make sure you can get back out. The sides of the parkway are often a bit muddy, so make sure you don’t get stuck. If you have a 4-wheel drive, it’s always a good option. Be prepared for crowds – The Parkway is incredibly popular, and often full of cars and people, especially in the fall. Mentally prepare for this before you pull onto The Parkway. Plan for extra time and be patient. Popular overlook parking lots are often full of cars and people. The best thing to do for this situation is drive past the overlook parking lot, and pull off to the side of the road and walk back up. Watch for people on the side of the road. We’ve had some close calls while taking photographs. RVs – As we mentioned, there are a number of tunnels on the Parkway. RVs are welcome on the entire parkway, including pull along trailers, BUT make sure your RV isn’t taller than the various tunnels. You can see the tunnel heights here. Assume your cell phone will not work – Cell phone service along the Parkway is spotty at best. Plan for your phone not working in most locations. If you require cell phone use, we would suggest getting off the parkway and heading towards one of them many local towns. Camping – Camping is permitted on the Parkway at designated campgrounds. You cannot, in most cases, just camp on the side of the road. For a full list of Parkway based campgrounds, go here. Also, you are not allowed to bring in firewood from other states due to harmful insects. Picnics and Food – Packing a picnic lunch and eating at one of the many scenic overlooks or picnic areas on The Parkway is a real treat and highly recommended. Just make sure you don’t leave any food or trash behind. Bring some water – Even if you aren’t planning on hiking, you might be tempted to want to walk out to one of the remote overlooks or down one of the shorter trails (Graveyard fields comes to mind). Bring some water just in case. Protect your food – Speaking of food, Make sure that food is packed in air tight containers if possible, especially if you plan to park and leave your car for any period of time. There are bears on the parkway, and they may break into your car to get to the food. We personally witnessed a bear breaking into a car up in the Great Smoky Mountain National Park because the owner left McDonald’s in the back seat of the car. Yep, true story. Bring hand sanitizer and/or “wet wipes” . Bathrooms along the Parkway are few and far between. They also may not have water, and when they do it’s cold and there isn’t any soap. Hand sanitizer comes in handy in these situations. My apologies for being a little crude, but this is important: Bathrooms are sparse. You just might get into a situation where you can’t “hold it” until the next pull off or bathroom and you might need to just find a tree. If so, the hand sanitizer and wet wipes come in very handy. Think I’m kidding? We see people, especially families with kids, doing this on almost every visit. Never hurts to be prepared! Just please don’t leave any paper products behind. Bicycles/Motorcycles – Bicycles and of course Motorcycles are both allowed on the Parkway. On any given day, you will often see many of both. Watch for them and when passing Bicycles, please stay far behind them until you get to a good straight area to pass. Do not try to pass them in a turn. Camera – Make sure you bring a camera, I can guarantee you that you’ll want to take pictures and plenty of them. Remember, the Parkway is not a means to a destination. The Parkway is intended to be a slow and relaxing journey, so that you can enjoy it. Drive slow, take your time and you will come away with a much better and more rewarding experience. Taken from an overlook on the Blue Ridge Parkway near Waynesville, NC in the fall – See our Fall Foliage Guide.